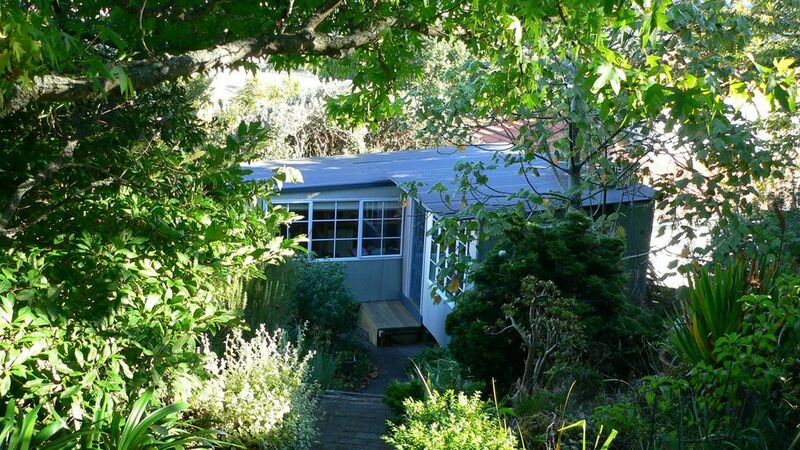 Self contained Cabin (26m2 footprint) located in almost an acre (about 3000m2) of common landscaped gardens on historic Mount Hobson (See Mt Hobson Domain on the map). Direct access to top of Mount Hobson. 5 minutes walk to cafes and restaurants. Location, location, location. 5 Minutes walk to public transport, bus and train. Please note that the access driveway is steep and there are a couple of steps to enter into the cabin. Tucked away in the extensive landscaped grounds of an executive home (owners on site), only 5 minutes drive to AKL City. Own gated access to peak of Mt Hobson which was a Maori Pa (Village) in pre-European days. Walking tracks with 360 degree panoramic views of City, Waitakerie Ranges, Mt Wellington, One Tree Hill, Coromandel. Rangitoto and South to Bombay Hills. Ideal City Stay or AKL base to explore NZ. 2 minutes from Market Road exit from State Highway 1. Walking distance to Remuera Shops, Cafes, Facilities etc. 2 minutes drive from Cornwall Park. 20 minutes from the airport. Broadband internet and WiFi access included. Two night minimum stay. (Except for last minute bookings). Visitors to please clean-up and leave Cabin as found. For guests who prefer not to clean up at the end of their stay our clean up charge is $30 per hour (minimum charge $30 if not left as found). Weekly rate from $650 per week (long term rate) subject to availability, time of year and length of stay - please enquire. We are John and Mali Morton. Originally from England (John) and Sri Lanka (Mali) we have enjoyed the good life in NZ since 1989. We have six accommodation options on Mount Hobson that enjoy 3000m2 of beautiful landscaped gardens with extensive views. We have gradually extended our accommodation business over a 12 year period and enjoy meeting guests from all over the world. Many of our guests have been new settlers in NZ. Often guests make an initial booking through an agency then book future stays (or stay extensions) direct with us. We bought our neighbors large home on a large section about 5 years ago with Cabin at the back of the section. We loved the location, the views and the beautiful gardens and the proximity to the City and all Auckland has to offer. Remuera is on an isthmus with the Eastern Beaches on the East Side and the Manukau Harbour on the West side. Remuera Village has grown to be a part of Auckland. Remuera is Auckland's leafiest green suburb. Remuera has numerous green spaces, most obvious of which is Ōhinerau / Mount Hobson - a volcanic cone with views from the top overlooking Waitematā Harbour and Rangitoto. Two wall heating panels and a Fan Heater. We can offer a cost reduction for guests who prefer to bring their own bed linen and towels etc. Please enquire. On site shared laundry washing facilities available for guests staying a minimum of one week. Under cover parking at the top of our very steep and long driveway. You will need to be a reasonable driver to safely access the carport. Under cover car parking for one car only. Basic dishes, pots & pans etc. Small kitchen in the main studio open plan room. Comprises: twin hotplate; small size fridge / freezer; microwave oven; kettle; toaster. No oven. Table and Chairs inside the Cabin overlooking the garden. 3000m2 of beautiful landscaped gardens leading up to Mount Hobson Reserve. Cabin is located in a beautiful garden setting about 8 metres from the undercover parking area. The driveway to the undercover parking is very steep and long (about 200 metres). Therefore a reasonable level of fitness and mobility is mandatory to enjoy the unique features of this special property. We have six properties on Mount Hobson with 3000m2 of beautiful landscaped gardens leading up to Mount Hobson Reserve on the summit of Mount Hobson. All properties have extensive views. We are close to Remuera Railway Station with fast and frequent services to/from the CBD as well as two main bus routes that pass either side of Mount Hobson. About a ten minute walk to Remuera Village. About a fifteen minute walk to Newmarket which is a main commercial / shopping area. About a fifteen minute walk along Market Road to Cornwall Park and then One Tree Hill which are extensive green areas.